Memorial Dedicated to the Fallen Soldier, 1941-1945, Gjilan. 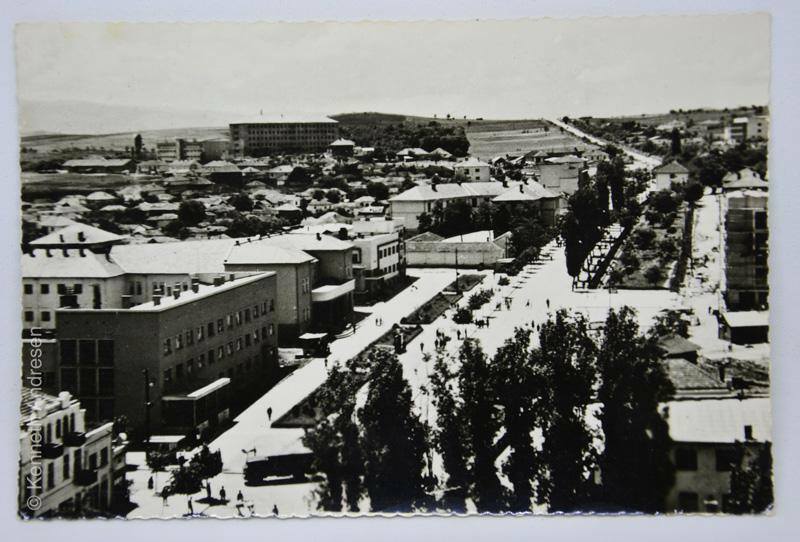 Maybe dated 1973, this postcard shows the memorial dedicated to the Fallen Soldiers, 1941-1945, in Gjilan, which is better known in the local community as the Unknown Soldier. 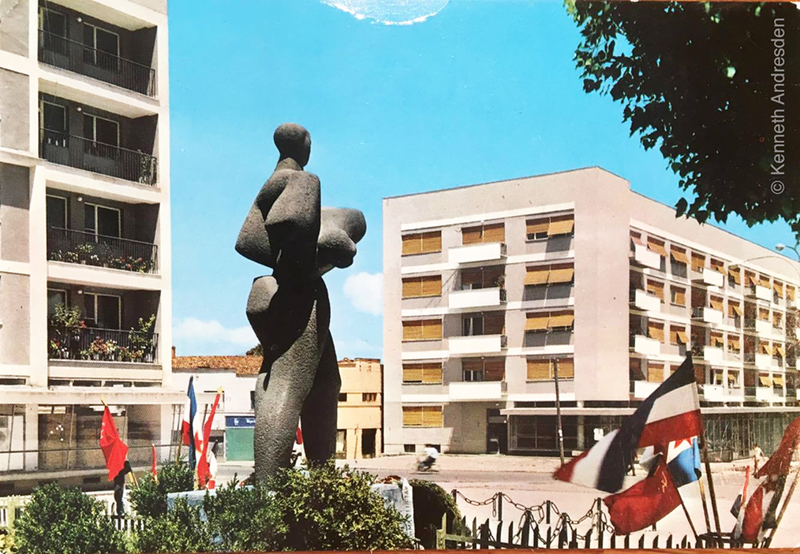 Built in 1963 as yet another testimony to the active victimhood of the partisans, this monument is Cubist in its appearance – a large human shape holding a dead in its arms, as an almost universal representation of care and grief. 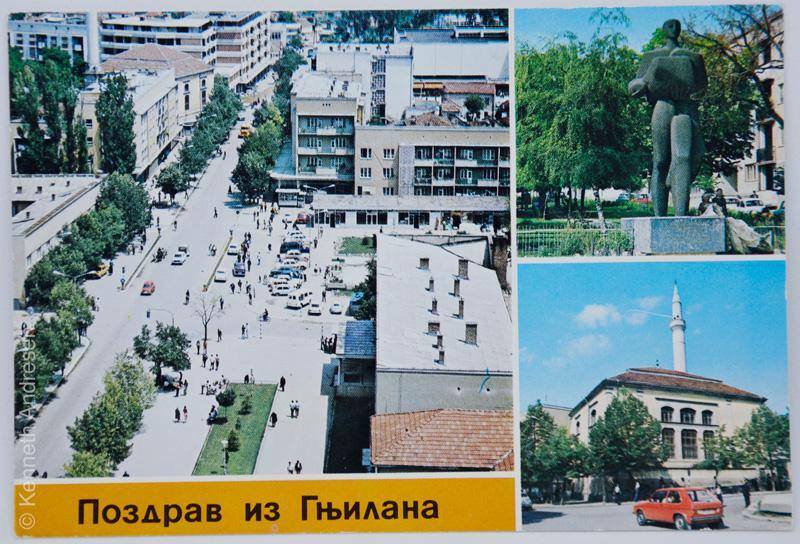 For more than 50 years, it has been a reference point for most residents of Gjilan, a signifier of the modern city, as many postcards show. 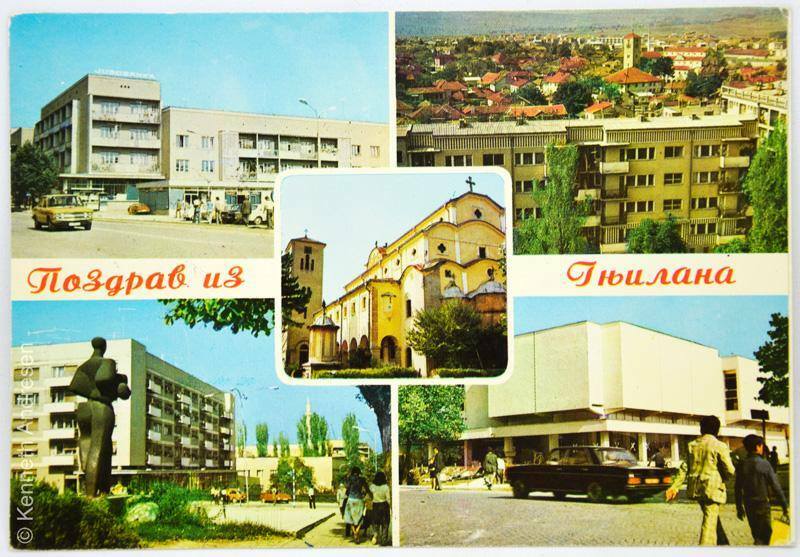 In the 1960s, it might have been the most modern-looking construction in a town still very close to nature, as a postcard of the center of Gjilan, dated 1964, shows. The monument had replaced a 1918 statue of the Serbian King Petar Karađorđević, but it has now been replaced in turn by a statue to Idriz Seferi, an Albanian hero from the region, who fought against the Ottoman Empire First, later Serbia during the Balkan Wars. 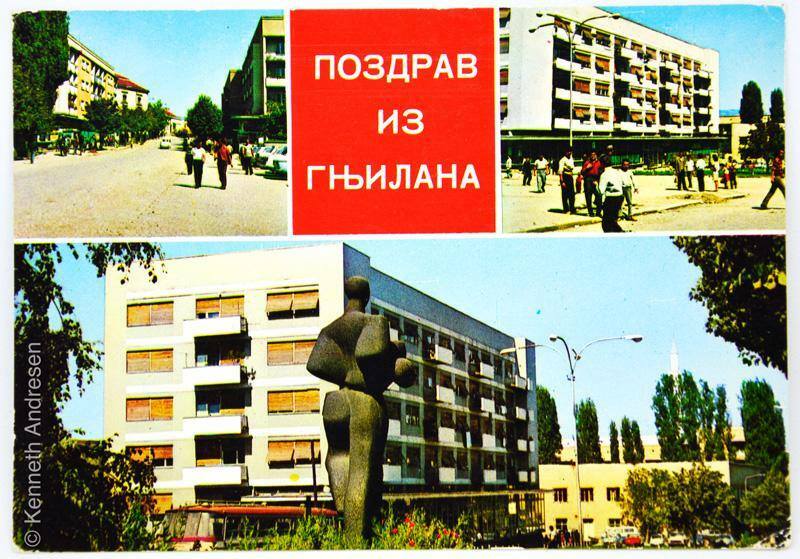 In November 2017, some sections of Gjilan and Kosovo civil society protested the removal of this monument, an action which they felt like a wound to their imaginary of the town. There are others, however, who are happy to see the monument go, because it reminds them of a dark time in the history of the place: the last months of the Second World War, when Gjilan was the scene of a massacre of civilians by the partisans. An oral history with a survivor, Enver Tali, recalls the event from the point of view of a frightened boy, Enver as a young teenager, who saw his family being killed before being threatened himself. Oral History Kosovo has joined in the defense of the monument with an open letter to the mayor of Gjilan. We feel that rather than destroying this monument, and erasing the history of Kosovo that celebrates the liberation from German Nazi occupation, the city should provide the context for the monument itself and memorialize also the history of the war that is not glorious.